Is Your Homestead Ready for a Winter Storm? 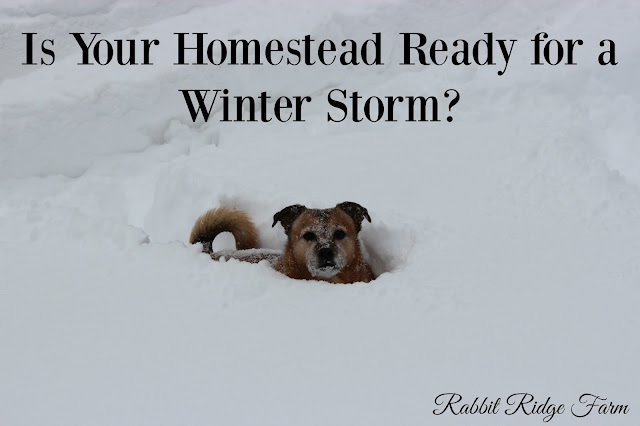 Uncategorized Is Your Homestead Ready for a Winter Storm? Winter storms all down the east coast offer an important reminder for any homesteader: preparedness. We don’t exactly consider ourselves “preppers” but you won’t catch us among those scurrying around the grocery store buying up all the water and shovels as the snowflakes begin to fall. If that’s you not to worry, we’ve been there. Here on the homestead our lifestyle allows and necessitates us to be ready for storms. Is your homestead ready? We think about four different categories of needs when storms hit and the power goes out: water, food, warmth, and light. This is how we prepare. One of our most obvious and immediate needs is water. We typically keep around 10 gallons of drinking water on hand and rotate through the jugs to keep them fresh. For our animals we get water from the small creek on our property. While its not as easy as filling their buckets without a hose it works well enough when the powers out. Like many other homesteaders we preserve as much food as possible during the summer and fall. 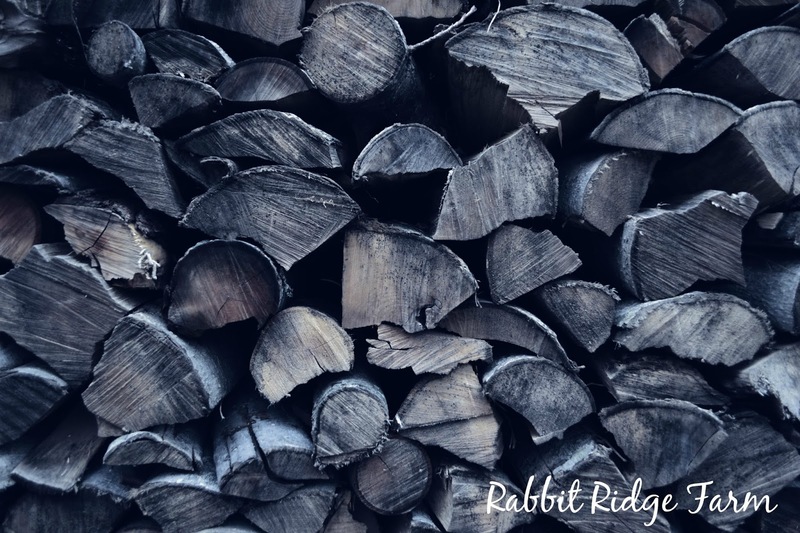 Especially since we soon hope to transition to off the grid entirely we focus on canning, root cellar storage and dehydration as our means of preservation. These methods can keep food safe without relying on electricity like a freezer does. We also purchase many of our necessities such as flour, sugar, beans, and rice in bulk so that its already on hand when a storm hits. While it may sound great, having these things on hand won’t help if you don’t know how to make meals from scratch. 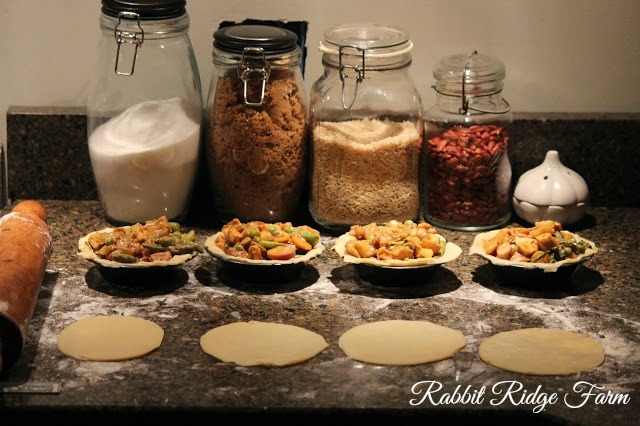 With a few simple ingredients we make our own bread, crackers, pasta and dinners. With these skills we don’t have to make grocery trips as often. Always keep your furry/feathered/scaled friends in mind when making any preparedness plan. Here at the sanctuary we also keep at least a week’s supply of animal feed (poultry, rabbit, dog, and cat) on hand. Ideally we’ll start keeping more. Even though we’re not totally off the grid I am so thankful that our heat is. We heat our house solely with a wood stove and can heat water and food on it as necessary. While this needs little extra preparation at the time of a storm it does require us to be prepared ahead of winter each year. Especially since we’ve moved to West Virginia we don’t rely on heat lamps to keep our chickens and ducks warm. We do buy bales of hay in advance so that if we can’t get out the road the chickens and ducks have fresh, clean, and dry bedding to stay warm. While light may not be essential for survival it can make a huge difference in mood. We’re all so adjusted to spending time indoors and having light at the flip of a switch we often forget how early darkness comes each winter night. Without power we still want to stay up past 5pm reading, doing puzzles, and checking on the animals. We rely on headlamps and oil lamps. We keep extra batteries and lamp oil on hand. The headlamp I use is a Petzl Tikka. It’s bright, easy on batteries, and I have had it for years. It even made an entire Appalachian Trail thru-hike with me through rain, snow, and freezing temperatures. I highly recommend them. Having plans in place to meet the needs of both you and your animals is essential to be prepared for winter storms or other weather events. What do you do to keep your homestead ready? Did we miss anything? We’d love to hear your ideas.